In each quoin of the Earth, there are approximately over million people suffer from mosquito borne diseases which are fearful and even cause harm to humans such as West Nile Virus, Malaria, Encephalitis , Dengue Fever. West Nile Virus is a serious underlying illness. It is considered as a seasonal epidemic because most mosquitoes are usually prevalent which starts from the summer and continuing through fall. West Nile Virus is usually spreads out by the bite of infected mosquitoes. Thus mosquitoes will become West Nile Virus carriers and they may start to bite humans or other animals and therefore West Nile Virus will be widely spread out. For some exceptional cases, West Nile Virus has also been spread out through blood transfusions, organ transplants, breastfeeding and during pregnancy from mother to baby. According to the World Health Organization, there are between 300 and 500 million people are infected by Malaria in Africa, India, Southeast Asia, the Middle East, Oceania, and Central and South America annually. Over one million of people were dead each year which are caused by the Malaria disease. Currently, there are approximately 1,200 Malaria cases are reported by the U.S every year and most of the infectors were infected from overseas area. Malaria is transmitted by Anopheline mosquitoes, they are usually actively bite people at night. Up to half of a billion people in worldwide are suffering from Chronic Anemia due to Malaria infections. Symptoms of Malaria will begin after 8 to 12 days being bitten. Arthropod-borne viruses are spread through transmission between susceptible vertebrate hosts by blood feeding arthropods such as, mosquitoes, psychodids, ceratopogonids, and ticks. 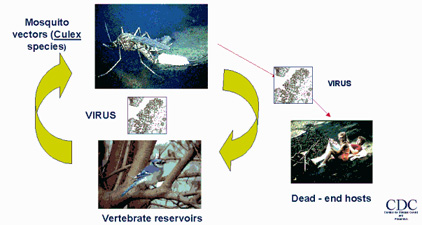 When the infected arthropod takes a blood meal, vertebrate infection occurs. Arthropod-borne viruses will cause human encephalitis which belongs to one of three virus families: Togaviridae (genus Alpha virus), Flaviviridae, and Bunyaviridae. Humans and domestic animals can develop clinical illness, but are usually considered "dead-end" hosts as they do not produce a significant amount of viremia and do not contribute to the transmission cycle. The virus may be passed from female hosts to their offspring through her eggs. Infection with dengue viruses will produce a spectrum of clinical illness ranging from a non-specific viral syndrome to severe and fatal hemorrhagic disease. Important risk factors for DHF include the strain and serotype of the infecting virus, as well as the age, immune status, and genetic predisposition of the patient. Dengue and dengue hemorrhagic fever are caused by one of four virus serotypes of the genus Flavivirus. Infection with one of these serotypes does not provide cross-protective immunity, so anyone who is living in dengue-endemic areas may have four times dengue infections or more during their lifetimes. Dengue is primarily found in tropical areas. The virus which is caused and maintained through a cycle involving both humans and a domestic day-biting mosquito called Aedes aegypti. However, there is a small, but serious, risk for dengue outbreaks in the continental US. Two types of mosquitoes, Aedes aegypti and Aedes albopictus are present and in specific circumstances, each could potentially transmit dengue viruses. This type of transmission has been detected in South Texas previously and associated with dengue epidemics in Northern Mexico. You should apply mosquito repellents for both outdoor and indoor activities even in a short period of time. It is risky that mosquitoes will notice you as target, if you are not protected. Therefore, be sure to apply MosRepel repellents which can last the maximum protection up to 180 hours without chemical added. Female mosquitoes will look for places of still, stagnant water to lay their eggs. Make sure your yard doesn’t contain any breeding areas for mosquitoes; tidy up premises and check for any accumulation of water inside premises; remove all unnecessary water collection and eliminate the sources; properly cover all containers those hold water to prevent mosquito from accessing the water; also change at least every week the water in flower vases and saucers of potted plants to prevent breeding of mosquitoes. Garbage must be removed and proper disposal, in order to avoid rodent-borne diseases and fly breeding. Copyright © 2000-2013 MosRepel Ltd. All rights reserved.